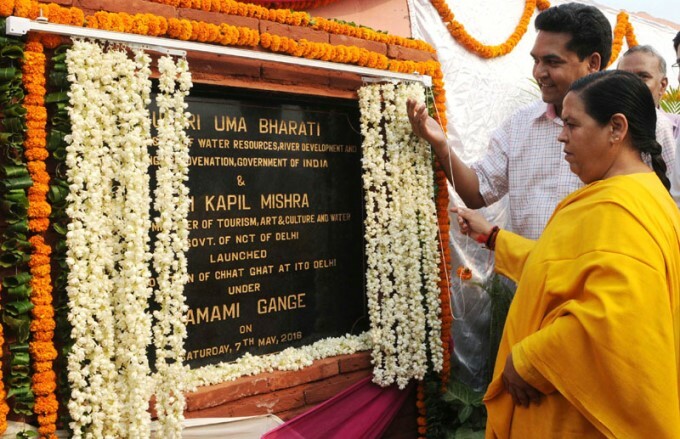 The Union Minister for Water Resources, River Development and Ganga Rejuvenation Sushri Uma Bharti recently inaugurated a few schemes of the Yamuna Action Plan (YAP) Phase-III in New Delhi. During the inauguration ceremony, the Minister informed that an amount of Rs. 800 crore will be spent on YAP III. The Minister also assured that the original character of Yamuna will be preserved while implementing Yamuna Action Plan. The Minister also informed that with the completion of Lakhwar-Vyasi project, River Yamuna will start receiving extra water and this will allow River Yamuna to be pollution free upto Mathura-Vrindavan. The Water Minister also informed that YAP III will also ensure repair and rehabilitation of sewer lines/ rising mains in Kondli, Rithala, Narwana Road, Anand Vihar, Hargovind Enclave, Vikas marg, Ashok Vihar and Jahangirpuri. The renovation of Chhatt Ghat has been approved at an estimated cost of Rs.2.51 Cr. This includes creation of toilet facilities at the Ghat and its beautification. The Union Water Resources Minister also flagged off the operation of Trash Skimmer for river surface cleaning on River Yamuna. The skimmer, which cost Rs. 4.5 Cr., can remove ten tonne trash daily Shri Kapil Mishra, Minister of Tourism, Art and Culture and Water, Government of NCT of Delhi was also present on the occasion. It may be recalled that cleaning of Rivers is an ongoing process and Central Government has been supplementing the efforts of the States for pollution abatement of river Yamuna in phased manner since 1993 under the Yamuna Action Plan (YAP). YAP I and YAP II were taken up in three states (Delhi, Haryana and Uttar Pradesh) with assistance from Japan International Cooperation Agency (JICA) for sewerage/interception and diversion of drains, sewage treatment plants (STPs), low cost sanitation/community toilet complexes, electric/improved wood crematoria, etc. Water is a basic necessity of life and River Yamuna is the principal source of fresh water for Delhi. Lets hope the Phase III of YAP bears better fruits than the previous two phases, in the best interest of the river and the people of Delhi.